The Scallywag twin bed can be converted to a Cabin, Loft, or Bunk bed using a Scallywag conversion kit! 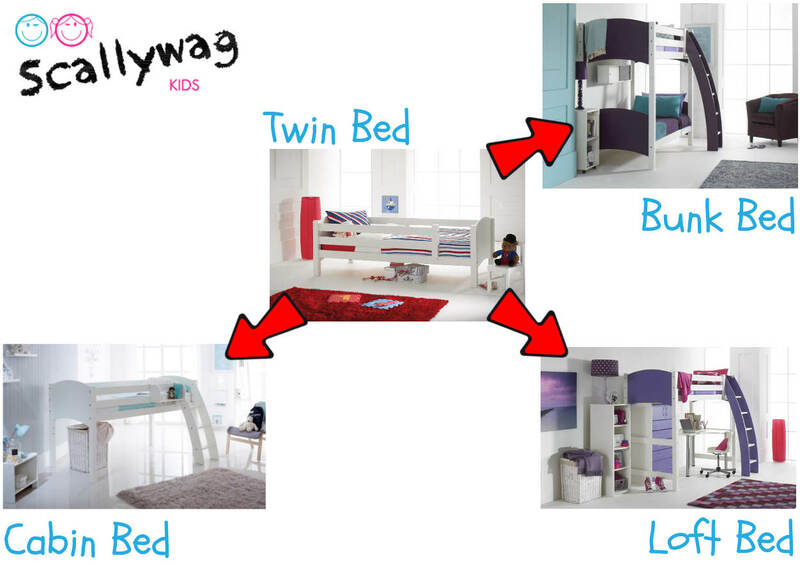 Save time, trouble, and expenses by keeping the original Scallywag twin bed and purchasing only the conversion kit when your child needs a new bed! The prices you see on our website are for complete beds, not conversion kits! If you already own a Scallywag bed and would like to convert it to another Scallywag bed you will pay a lot less and receive a conversion kit to convert your existing bed to your new bed. For example: twin bed to cabin bed or loft bed to bunk bed. This is the great benefit of the Scallywag system. The kits are not yet listed on our website because the Scallywag system is new in Canada and not many customers had to convert their beds yet. You can find all assembly instructions on our Manuals page.